These girls came over one of the last nights before I left and helped me pack and clean the house. While they were there, I got out a big bag of my clothes that I was taking to the charity shop for them to go through first. They all picked out something and jokingly said they would wear it every Tuesday night for Craft Night to remember me by. 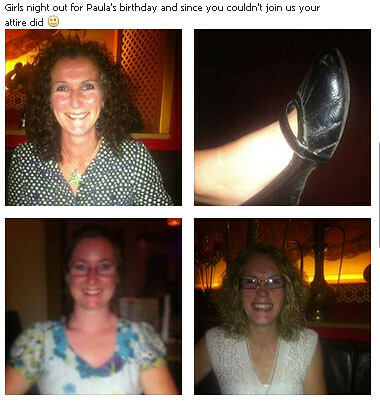 Obviously, it was a joke, so when I saw these pictures, and saw that they actually wore my clothes on Paula's birthday night out, it put a huge smile on my face. I'm still smiling. They haven't forgotten me any more than I've forgotten them. I love you guys. Hope you're still saving money in your jar to come visit me!